Business Wire, the world's leading service provider for global press release distribution, was the official sponsor of this year's Communications Congress in Berlin and presented an exciting panel discussion on communication and courage in the digitalization era. Bodo von Braunmühl, Head of Corporate Communications at the Delivery Hero online delivery service, Natascha Thomas, Head of Marketing and Sales and member of the Management Board of the news agency Agence France-Presse (AFP) Germany, and Harald Zulauf, CEO of mc Group, took to the podium at the Berlin Congress Center (bcc). Together with the moderator Christine Riedmann-Streitz (MarkenFactory GmbH), the three renowned decision-makers from leading companies presented their ideas on "Impactful Communication in Times of Digitization - How is it created and what role does courage play?" to the well-filled hall with around 200 participants. What was made clear is that: In the age of fake news and news algorithms, digital media face enormous challenges. The full panel discussion is available on YouTube. Natascha Thomas, member of AFP’s Management Board, sees the debate about fake news – which really took off with the surprising election of US President Donald Trump – as an opportunity for traditional media. They are in greater demand again. "News agencies are gaining in importance," stated Thomas. This is also due to the loss of subscription and advertising revenues: Traditional newsrooms will have to satisfy the growing demand for credible news with fewer journalists. This is where the traditional press release comes in. Zulauf and von Braunmühl do not want to go without this established form of communication. "The press release is a small lighthouse signaling that I am something special," explained von Braunmühl. Mr Zulauf stated the point even clearer: "A good relationship with major press agencies is a thousand times more important to me than the five hundredth Like on Facebook." Mr Zulauf reported on a "drastic decline in the credibility of social media", which is why he will continue to rely on traditional media in the future. Predictions that future media budgets will "only go to the Facebooks of this world" were wrong, Zulauf said. “The big shift has not taken place." Even digital companies continue to rely on advertising on television and by traditional means of communication. This was also confirmed by Mr Braunmühl: "Digital and digital media play a significant role for us, but the mix of channels is very important. The right media mix is not a rigid construct for Zulauf: It depends on the subject, the country and the customer’s budget, Zulauf explained: "There are indeed countries in which faith in everything online is enormous, especially where there is no freedom of the press." In line with the motto of the congress which boasted more than 1,500 participants, 110 lectures and 150 speakers, the participants also held a discussion on the question of "courage" in communication. Von Braunmühl promoted authenticity over courage. Good communication must convey a credible attitude. Ms Thomas added that it is courageous to say "no" to a customer who has no meaningful ideas. The AFP Services service unit, which is independent of the news agency, can provide customers with in-depth advice here. Zulauf sees no contradiction in this: The mc Group is both authentic and courageous because it advises health agencies and ministries in numerous countries and therefore rejects tobacco and alcohol producers as customers. For the future it is important to familiarize experienced PR colleagues with the opportunities social networks provide, said Zulauf. The situation is different for young professionals: "We have to teach our younger colleagues that this is not the real world." Thomas called for more openness to technical innovations in journalism and communication in Germany and Europe. "We don't all have to become programmers, but we have to be more tech-savvy with new things," stated Thomas. Then the discussion presented by Business Wire could possibly be continued in the virtual world in 20 years’ time. Watch the panel discussion now and learn more. You can find more information at services.BusinessWire.com and Tempo, the source for the latest trends in the communications industry, or follow updates on Twitter:@BusinessWireDE and @BusinessWire. On September 27 and 28, around 1500 communication specialists met at the Berlin Congress Center (bcc) on Alexanderplatz. 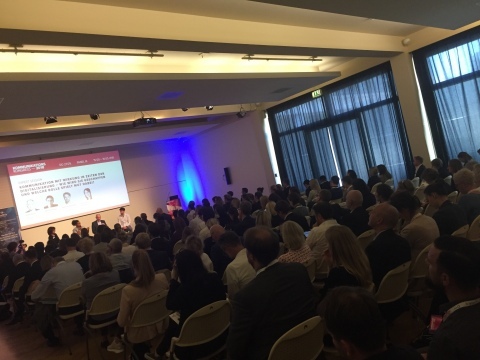 More than 150 speakers shared their experiences and inspired their colleagues with best-case presentations, keynote speeches and panel discussions at the annual event organized by the Federal Association of German Press Spokespersons (BdP) and Quadriga. Keynote speakers at the congress, under the motto "Courage", were ZDF journalist Dunja Hayali and Federal Family Minister Franziska Giffey (SPD).